Utilize the map below or request turn-by-turn directions to LeBrun Toyota. 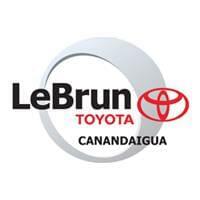 We want to prove to you why we are a leading Toyota dealer in the Canandaigua area. Call us at (585) 394-5280 or fill out the form below with any questions or to schedule a test drive. Still looking for the perfect vehicle? Browse through our current inventory of New Toyota models, Used Toyota’s or other used cars for sale. Our Personal Auto Shopper will personally search for your next vehicle if it is not within our inventory!